WASHINGTON — Under a fresh cloud of overseas violence, Donald Trump and Hillary Clinton added to their delegate troves on Tuesday with victories in Arizona as the 2016 presidential contest turned into a clash of would-be commanders in chief. 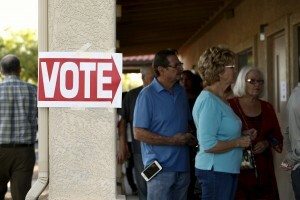 Long lines and high interest marked primary elections across Arizona, Utah and Idaho that were largely an afterthought for much of the day as the world grappled with a new wave of bloody attacks in Europe. The Islamic State group claimed responsibility for a series of blasts in Brussels that left dozens dead and many more wounded. Democrat Bernie Sanders and Republicans Ted Cruz and John Kasich hoped to reverse the sense of inevitability taking hold around both party front-runners. Anti-Trump Republicans are running out of time to prevent him from securing the 1,237 delegates needed to claim the nomination. The billionaire warned Cruz he would “spill the beans on your wife” after an anti-Trump outside group ran an ad in Utah featuring Trump’s wife, Melania, in a photo shoot that ran in GQ magazine more than a decade ago. Trump’s brash tone has turned off some Republican voters in Utah, where preference polls suggest Cruz has a chance to claim more than 50 percent of the caucus vote — and with it, all 40 of Utah’s delegates. Trump could earn some delegates should Cruz fail to exceed 50 percent, in which case the delegates would be awarded based on each candidate’s vote total. Associated Press writers Catherine Lucey in Everett, Washington, Jonathan Lemire in New York, Jill Colvin in Washington and Michelle Price in Orem, Utah, contributed to this report.